Wanting To Save Space In Your RV But Still Easily Keep It Clean And Spotless? Every RV owner knows that there is one thing that they think about before they make any purchase and that thing or thought is "space". This small 8 inch tall by 4 inch in diameter plastic bottle takes up very little space. It is a very concentrated powder ,that when mixed with water, provides 8 gallons of RV cleaner. Look at all that space you just saved. Not only that, but you clean multiple surfaces with this product eliminating all the other bottles of cleaners that just clean specific surfaces. This product is non-toxic and biodegrades rapidly. It is safe to dispose of anyplace and there are no chemical odors or obnoxious fumes. Being in a powder form, there is no expiration date and when mixed with water you are getting a very strong cleaning agent that contains millions of tiny little bubbles that makes cleaning so easy. The product uses a very safe and "green" cleaning agent as its main ingredient is "hydrogen peroxide". Hydrogen peroxide mixed with other various safe detergents has made an all-purpose RV cleaner that should be in every RV. It is so versatile that if you had to pick one cleaning agent due to limited space, you would be very happy with RV Mold & Mildew Wash.
Just sprinkle in a wet toilet, scrub and flush. The product is actually great for the pipes and holding tanks, it will clean them on the way down and also de-odorizes. Sprinkle in a wet sink and scrub or mix and spray sink and scrub. Mix in spray bottle, spray and wipe up mold or food spills, the oxygen activity completely breaks down organic material making it easy to clean. Excellent on soap scum and leaves a fresh scent behind. Will remove any stain from the floor, will not stain any surrounding carpet, rugs or any surface that it may come in contact with. Roofs get filthy and it's something that you need to keep up with, just spray the roof, scrub with a brush and rinse off. Excellent on awnings. Awnings always get moldy and discolored because you are rolling up moisture into a condensed area and that breeds mold, so just spray the RV Mold & Mildew Wash on the awning, scrub and rinse, it will not stain, discolor or eat away at the fabric like bleach would. 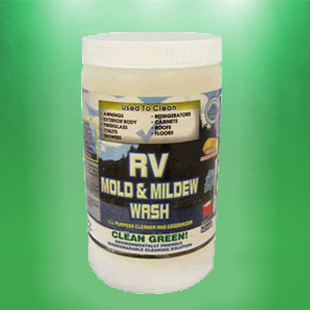 BUY RV MOLD & MILDEW WASH NOW! Add ½ cup per gallon of water, mix well, stirring frequently, allow solution to fully activate for 15 minutes prior to use. Clean small sections at a time. Apply product with "garden-style" pump sprayer or mop, scrub with brush, keep area moist with product while brushing and rinse with water. For "professional results, a pressure washer may ne substituted for scrub brush and hose.